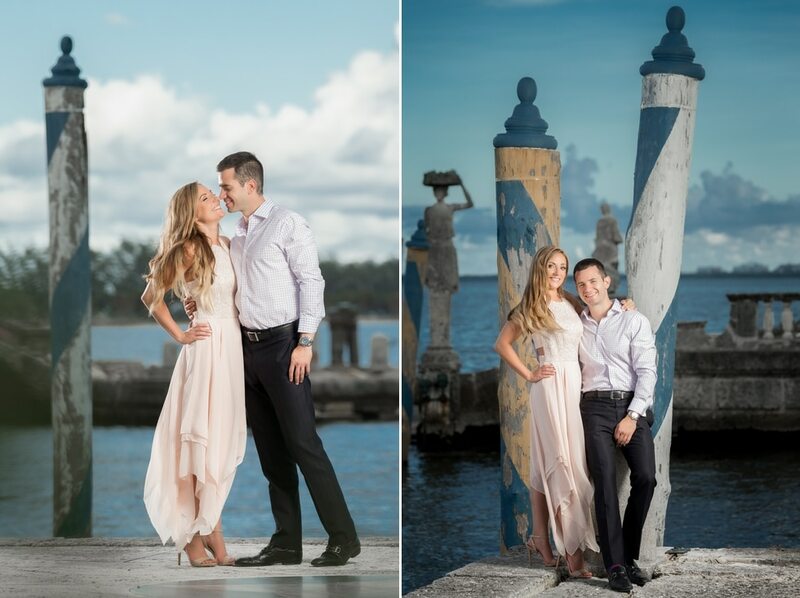 Vizcaya engagement sessions are among some of my favorite as a Miami Wedding Photographer. It’s just one of thous places that can’t be beat when it comes to the backdrop, look and feel. But.. here is the “thing” with Vizcaya Engagement Sessions, they are VERY popular, and some clients (and even myself) often think “where else can we go, because everyone does Vizcaya”. This is very true, and I will admit that after 8 years of being a full-time Miami Wedding Photographer I too often think outside of the box for ideas on unique places to go and shoot. I mean, it’s not like Vizcaya is the ONLY place to go to get nice images LOL.. it’s just that for most people this is a very good option as it relates to photography. This brings up a very nice point that I want to talk about, and that’s the “practical application” of your images. (more on this at the bottom of this post when I tie this all together) Often time’s I will meet with clients and they may have very specific ideas when it comes to where and how they want styled images taken of them. I think this is great, and understandably I do get excited when this happens, because I think to myself “cool, something different”. BUT.. at the same time this is (can) be a big liability. Let me explain..
A few years ago Steven & Melissa came to me, and wanted me to replicate some dance moves for them because this is where they met and something they enjoyed doing together. It was “them”, and what they wanted. (we also did a few other ideas as well). I was pretty intimidated and yet excited all at the same time. I knew in my head (and in their head) this could come out really cool. BUT, it also could be a huge flop. So many variables.. where are the dance photos going to happen? What is the background going to look like? Is this going to translate into nice images? Will I be able to capture the “dance” look that I knew they were going for? etc..etc.. To be totally honest, part of me was thinking this might be a nightmare.. and I would be in the horrid position of letting my clients expectation exceed what I thought would be possible, and in this business of photography.. it’s all about keeping people on the same page, so they are happy. So, we tried it.. and you know what.. it came out amazing. Here is the link: Melissa & Steven’s Engagement session. So, clearly Vizcaya Engagement Sessions are not for everyone.. and that is totally cool, and makes my job a lot more fun! Let me share another story with you, where things were not so great for some honest contrast.. Yesterday (and is why I am very motivated to talk about this today) I had a session with a young beautiful couple, and she really wanted to do a session with a horse. She loves horses, and wanted to find the “perfect” place for this to happen. She went to several places, barns, parks, etc.. and worked so hard to for fill her dreams, (and more to the point expectations) that she had in her head. She wanted a session with a horse. Period. She asked my thoughts before hand, and I very carefully tried to explain that I felt like it maybe a hard thing to do. I expressed that while I did have some cool ideas on how we could create a “story” of images with the horse.. I was not confident that it would come out, because.. well.. we are dealing with an animal. Not only that, but I am dealing with TWO people that need to be posed, and directed along with the horse.. and I felt that this was not the best idea. BUT.. she really wanted to do it, and I communicated that we would go and “do the best we could” that’s all anyone can expect of any photographer. Hell, I wanted this to come out even more then she did! LOL.. Come on.. a session with a beautiful couple and a horse! Right?! So cool! After we arrived on location.. it was clear that what I had feared was in fact the case. The horse was difficult to manage, the soon to be groom was not overlay in love with the idea of the “horse thing” (the horse actually bit him at one point) and was more / less going along with this to make her happy, which is nice.. but, I think for something like this you both need to be on the same page. Looking back at that dance shoot I posted, do you think the images would have looked anything like they did if only one person was “into” the dance idea? Likely not. You both need to “dance” and be in the same place when it comes to a session like this. If your not, or if you have to convince your other half to do something that you knew he’s really not into.. than don’t do it. Now, as it turned out.. due to sheer volume of images that I took.. I got enough “lucky” shots to meet the expectation. This was also aided, by me being totally transparent and honest with my client’s. I don’t “sugar coat” anything, and I don’t tell you “what you want to hear”. I stick with reality, and am honest. This is because at the end of the day it’s all about your expectation, and my ability to meet or exceed that. This is why you are paying me, and it’s my responsibility to communicate all that I can when and if I don’t think things are working out. So, 5min into this shoot my client’s knew that this was not coming out well.. and we accepted that together right then in there, and decided to make the best of it. This way, if by chance (or luck in this case) I got a great shot or two.. they would understand that this was all that’s possible. After all, there is only so much I (or anyone) can do. So let me bring this full circle, and get back to the practical application of the images that we take. This is why Vizcaya Engagement Sessions are a breath of fresh air. LOL. In practical terms, stop and think about what your going to –actually– do with the images? Be honest. What ARE you going to do? Are you going to make a few prints and put up in your home? Are you going to make a book with several pages featuring the images? Are you going to use a few for your phone wallpaper and the rest will sit in a folder somewhere? Maybe one or two will be used for the save the date? When you start thinking about the “end use” it becomes clear that often times it makes the most sense to simply to go places that just have a “nice” backdrop. Just because you like horses, or want to try and re-create your first date.. it may or may not transcend into nice images as it relates to photography. My advice.. is stick with proven places for the engagement session that are very nice unless you really have put in the work to secure a special location and you both have ideas that wont leave much to chance. i.e. you love airplanes.. then rent a plane.. you want something different and have access to a super nice estate.. then lets do it! EVERY photographer loves a new adventure, and no one loves that more then me. Trust me when I say that. But, because money and expectations are exchanged in these shoots, there is also a responsibility that comes with it. It’s no wonder why Vizcaya Engagement Sessions are in fact so popular (and other places like Vizcaya) it’s impossible to go wrong. So, if your looking for horse pictures understand that it’s a gamble and a game of chance! You know, ironically even if the images came out incredible with the horse.. I would never want to show them on my site / blog. Why? Because, it would foster the expectation to others that “we can do nice horse shoots” and this would only lead to someone else being very disappointed in the future. This is very much my mindset with all of my business, and is the foundation in which I operate. So now let’s take a look at just a few images from my client’s Brittany & Todd. I shot this session several weeks ago, and had some travel out of state recently and now am posting their shoot. I have lots of other Vizcaya Engagement Sessions posted on my blog as well, and I think this is kinda the point. For some, they want what they see. When you see my site and blog, you form an expectation on what you will in fact get for content. 90% of my job is to manage that process, and then 10% of it is going out in the field and snapping the images. Vizcaya Engagement Sessions (or any session in a place like this) represents a very relaxed, controlled, and predictable experience with results that make the most sense when it comes to practical application. I think that peace of mind sells, and for me is one less thing I too have to worry about 😉 But, if you do have some wild ideas of your own, be sure to let me know and I will be more then happy to check it out with you to see if it will make sense, and to see if I think I can bring to life what you may expect. BTW.. huge thank you to Brittany & Todd for taking myself and my assistant Jorge out to dinner after the session. We really appreciated that, and loved getting to know you both so much more. I had never had Greek food before, and now I love it! LOL. You both were the best, and we cant wait until the wedding! Let me start off with this image above, looking back at the Vizcaya mansion. The sun was in the perfect position to lit the building.. and I wanted to use this to my advantage, so I used my powerful lighting and dialed in the exposure on my clients to match. I did not want to “show” everything in the foreground, and needed an “excuse” to crop in tight. I shot this compressed at 200mm and got my cover shot 🙂 With many of the shots taken, it’s not really about the location anyway. It’s about driving contrast, and separation. Looking here (above) you see what I mean. The first thing I notice in the images is not “Vizcaya”. it’s THEM. This comes down to the outfits, the lighting, and the tight crops. The background merely becomes a suggestion of this “nice” place. Client’s often speak about not wanting images that look too “posed” I think this is funny (yet totally understandable) Everything (well everyone) needs some direction. It’s up to the photographer to make them look a specific way. This by the way, now departs “photography” and gets into the other aspects of the photographers personality, abilities and confidence level. I have a “frame work” that I follow when working in the field. It’s very much about finding the best lighting, leveraging the location / composition and getting the clients into some sort of loose pose. From there I take some shots, and then let my personality take over and do the rest. You can see this more in some of my behind the scene videos.. which is one of the best parts of my entire website, and illustrates why I am “Travis Harris” 😉 Here (above) loose direction, my personality, and an attention to detail ensure a nice “candid” result.. that, was in fact all controlled to start with. This is an “art” form all within it’s own and is what makes one photographer differ from another. Notice, her camera side leg.. it’s crossed over the other giving her a very flattering stance. Small details like this make a big difference. It’s the hint of color, and out of focus background that set’s the above two images off. It’s also the lighting, and the fact that at this point we had been working with them for over 2 hours. At this point I have built more of a “working” relationship with them, and the trust is there. I am free to say things, and also be myself. It’s at this point where client’s tend to loosen up the most and generally the best shots are captured. This is another reason why I don’t offer silly little “two hour” sessions. To get nice shots, it takes time.. and can read some tips on my sessions here. I will admit, I would not have taken this above picture unless she had mentioned to me that she wanted a picture of her ring. But, rather then just taking a photo of her ring.. I wanted to try and do something a little better. I wanted them to also both be in the shot. So, this pose was all about making the “excuse” to show off the ring without it being silly. I think I accomplished that here. The key points here, were to shoot from above, and to ensure that his face was pointed near her’s. (this way its not just the back of the head), her eyes must be closed because the focus needs to be on the ring! Love it. After dinner, we took them to Brickell Key for a few night shots. It was quick, easy, and TOTALLY worth it! 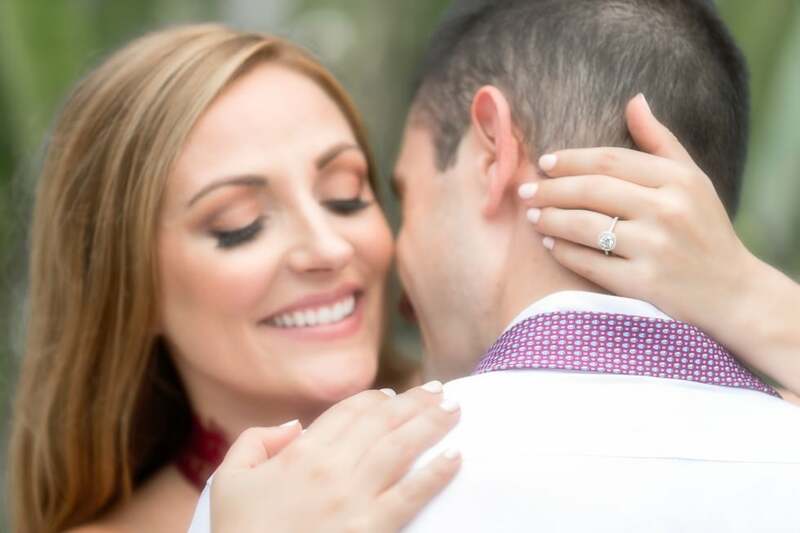 Travis- thank you so much for the BEAUTIFUL photos at Vizcaya! The end results were stunning. I had limited availability to get these done, and Travis worked with us on scheduling and planning and really gave it his all. Despite it being 85 degrees out [and a fiance who just wanted to get it over with 🙂 ], the photos came out amazing. Travis is truly a professional- very knowledgeable, creative, and was so fun to work with. I would definitely recommend Travis to all my friends!